This week, Samsung's stock price hit a two year low as analysts slashed profit estimates again. It has become increasingly clear that Samsung is a victim of low-end disruption, caused by intense competition from Asian vendors like Xiaomi, Lenovo and Huawei. In many ways, Samsung is in the same predicament as IBM was during the PC wars. The story of IBM's decline and subsequent revival could hold the key to Samsung's recovery. The launch of the IBM PC in 1981 had a significant, positive impact on the company's financial performance. 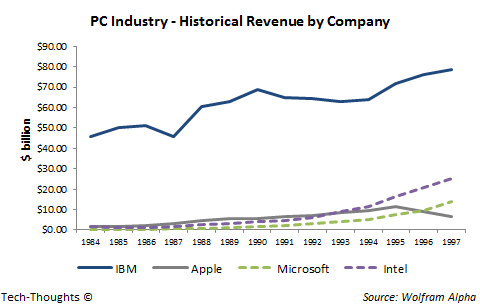 However, IBM was also the first company to feel the effects of increasing competition from PC clones -- as early as 1989. After a brief uptick, revenue declined in the early 90s, which then triggered steep losses. Why was IBM the first company to face this decline? The answer is quite obvious -- IBM's products were diversified across price points. And when "good enough" PC clones entered the market, IBM's products were the first to be caught in their upmarket march. On the other hand, Microsoft and Intel, suppliers of the two most valuable components of the PC, saw a sharp uptick in their revenues and profits as downstream competition intensified. But, thanks to Lou Gerstner, IBM also found a way to recover from this decline. First, IBM refocused on their core competence to stabilize their business (selling mainframes to enterprises). Second, and more importantly, IBM de-emphasized highly competitive, commodity businesses and pivoted their business model to focus on layers of the value chain that were not over-served. 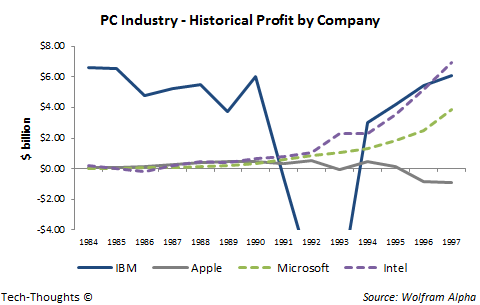 Thanks to intense price competition and "good enough" products, PC penetration was skyrocketing among businesses. This created an opportunity to profit from new demand for enterprise services and systems integration. The first half of this IBM's story clearly describes Samsung's predicament today. Competition from Asian OEMs has had a significant impact on their low-end and, increasingly, their mid-range business. No matter how hard they try, it is very difficult to compete against companies with far lower cost structures (and sometimes, entirely different business models) -- for example, Xiaomi sells devices at cost and has virtually no inventory and marketing expenses. At the same time, Samsung's premium portfolio cannot make up for revenues lost at lower market tiers. This has put Samsung in a tenuous position. However, Samsung also has an opportunity to follow IBM's path to recovery. Samsung's core competence lies in manufacturing and, consequently, in components. Thanks to lower prices and intense competition, sales of cost effective Android devices have been exploding. As a result, Samsung has a huge opportunity to become a supplier to every OEM they find themselves competing with. In other words, Samsung's recovery could hinge on selling ammunition instead of fighting a losing battle.